Hungry? Need to fill your culinary calendar? Here is where you will find all the restaurant and culinary happenings in Orange County. GAYOT features a calendar of special dinners, tasting menus, prix-fixe meals, food festivals and other culinary events, including regularly occurring food events as well as special one-time-only events featuring top chefs. Keep checking back so you can know all that's going on in the world of restaurant and food events in Orange County. Taste of Huntington Beach returns to the Huntington Beach Sports Complex. Guests will have the opportunity to sample an eclectic range of bites from some of the city’s top restaurants along with sips from several Southern California craft breweries and California wineries. Select restaurants include Pacific Hideaway, BLK Earth Sea Spirits, solita Tacos & Margaritas, and Duke’s Huntington. The event is scheduled from 1 p.m. to 4 p.m., with VIP early entry at 12 p.m. Tickets are $70 and $60 for designated drivers. VIP tickets are $90. Ticket proceeds support the The Friends of the Children’s Library non-profit organization. Visit the website for more information. Taste of Huntington Beach, HB Sports Complex, 18000 Goldenwest St., Huntington Beach, CA 92648, no phone. TAPS Fish House & Brewery in Irvine is hosting a Pahlmeyer wine dinner. Attendees will have the opportunity to enjoy a five-course meal featuring dishes crafted to pair with selections from the popular Napa winery. Select courses include fried softshell blue crab with citrus, rhubarb, buttermilk crème fraîche and rocket arugula; saffron and ramp wild boar gnocchi; and grilled NY strip steak with charred onion purée, hen of the woods mushrooms, and fried truffle potatoes. Cost is $135 per person, excluding tax and gratuity. Dinner is slated to start at 6:30 p.m. For more information, please visit the restaurant’s website. TAPS Fish House & Brewery, The Market Place, 13390 Jamboree Rd., Irvine, CA 92602, 714-619-0404. 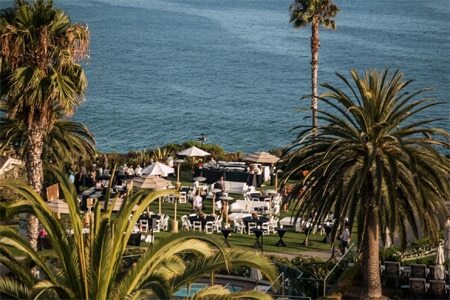 The 12th Annual Laguna Beach Taste of the Nation returns to Montage Laguna Beach resort. Guests who attend the fundraiser will have the chance to indulge in sumptuous bites prepared by a lineup of acclaimed chefs, led by Australian celebrity chef and childhood culinary advocate Curtis Stone. Attendees will also get to sample fine wines and craft cocktails, participate in silent and live auctions, enjoy live music, and mingle with talent at the event’s after-party. Tickets are $250, and $275 for early VIP entry. Proceeds go toward Share Our Strength’s No Kid Hungry campaign, a program devoted to eradicate domestic childhood hunger. The event is slated to run from 3 p.m.-7:30 p.m.; VIP entry begins at 2:30 p.m. Visit here for more information. Montage Laguna Beach, 30801 S. Coast Hwy., Laguna Beach, CA 92651, 866-271-6953. 320 Main in Seal Beach offers happy hour Tuesday through Saturday 3 p.m.-6 p.m., as well as all day on Sundays. (There's also late-night specials from 9 p.m. to closing Tuesday through Thursday.) Partake in $5 cocktails, beers and select wines and $6-$8 appetizers (shishito peppers, buffalo chicken cheeseburger sliders). 320 Main, 320 Main St., Seal Beach, CA 90740, 562-799-6246. EATS Kitchen + Bar, the flagship eatery in the Hotel Irvine, features happy hour daily from 5 p.m.-7 p.m. Enjoy bites starting at $3 (fries, wings, garlic tots, etc. ), along with $4 draft beers, $5 cocktails (blackberry mule, prickly pear margarita, etc.) and $6 glasses of wine. EATS Kitchen + Bar, Hotel Irvine, 17900 Jamboree Rd., Irvine, CA 92614, 949-230-4452. On Sundays, Fullerton locals can receive 20% off their check at the romantic restaurant The Cellar. (The discount does not apply to the prix-fixe menu.) The Cellar, Villa del Sol Shopping Center, 305 N. Harbor Blvd., Fullerton, CA 92832, 714-525-5682. Three-Seventy Common Kitchen + Drink hosts a special Sunday Social dinner specifically designed to be reminiscent of a classic Sunday family supper. From 4 p.m.-9 p.m., restaurant owner and executive chef Ryan Adams jettisons the restaurant's normal menu and prepares one rotating, multi-course dinner based on seasonality, fresh ingredients and the concept of comfort food. Prices vary. For a look at the weekly changing menu, please visit www.370common.com. Three Seventy Common Kitchen + Drink, 370 Glenneyre St., Laguna Beach, CA 92651, 949-494-8686.